The 15th-ranked Oregon Ducks and the 25th-ranked Baylor Bears squared off in a battle royale Friday evening at Matthew Knight Arena with the Ducks coming away with a five set (25-15, 13-25, 25-17, 22-25, 15-13) heart attack of win to advance to the Sweet 16 round of the 2018 NCAA volleyball championships. 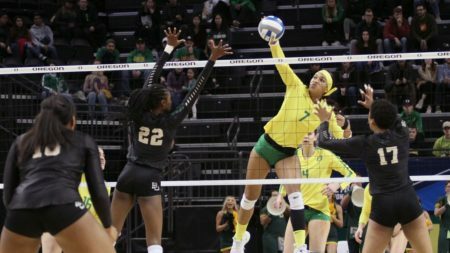 As it had been in Oregon’s opening round victory over the New Mexico State Aggies, senior outside hitter Lindsey Vander Weide again and again put balls on the floor for the Ducks when they needed a point or a side out. Oregon opened the first set clicking on all cylinders offensively, taking a 20-9 lead before the Bears found their bearings, rallying back to within six points before Taylor Borup closed out the set with back-to-back kills. Baylor flipped the script in set two. Tied at 5, the Bears outscored the Ducks 20-8 the rest of the way to even the match at a set a piece. Round three was more of a toe-to-toe slugfest with Oregon never trailing after breaking a 2-2 tie, then grinding their way to a six to eight point lead down the stretch, Willow Johnson’s service ace wrapping up the set at 25-17. Oregon picked right up where they left off in set four, taking an early lead and holding the advantage until late in the set when Baylor leveled the score at 20 then out pointed the Ducks 5-2 to send the match to a deciding fifth set. They didn’t. Oregon jumped to a 11-5 lead and held off a late Baylor push to advance to the second weekend of the championship for the first time since 2014 and for the first time in Vander Weide’s career. In her last appearance at Matthew Knight Arena Vander Weide was busy, taking an unheard of 60 swings and posting 21 kills to lead the Ducks. Willow Johnson added 11 kills and was again a weapon from the service line with three aces. Oregon out hit the Bears .244 to .208. Oregon’s opponent in the round of 16 is yet to be determined, as is the time and date. All that is certain at this point is the Ducks are still playing and ready to take the show on the road.